South Carolina's second 'Stand Up Sunday' will be observed on January 29, 2017.
on that Sunday, and by taking steps to draw attention to gun violence prevention. Stand Up Sunday is being organized statewide by Arm-in-Arm: South Carolinians for Responsible Gun Ownership, formerly Gun Sense SC. This independent nonprofit group adopted a new name on January 23. It seeks to address the public health crisis of gun violence by educating citizens, building awareness, and supporting nonpartisan legislation. Bishop vonRosenberg was among the 79 bishops who marched in Salt Lake City to bring awareness to the problem of gun violence. 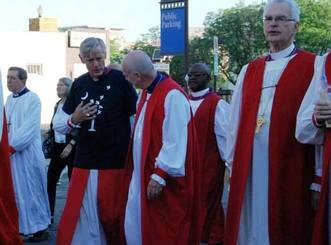 Members and friends of South Carolina's Deputation to General Convention wore tshirts honoring the Emanuel Nine at the Episcopalians Against Gun Violence Rally in Salt Lake City on June 28, 2015. 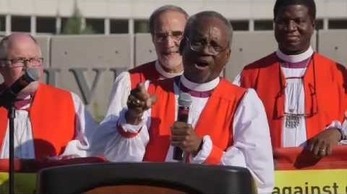 Michael Curry was among the bishops who spoke against gun violence at the rally on June 28, the day after he was elected as the 27th Presiding Bishop of The Episcopal Church.